Summer-like temps arrive right on cue. 100° Heat. Jeff Ranieri Has Triple Digits. It's like the earth's weather system saw the date and the calendar and knew what to do. Tuesday at 10:16 a.m. PST, the summer solstice officially arrives. A few hours later the Bay Area is predicted to see the hottest temperatures since late September. 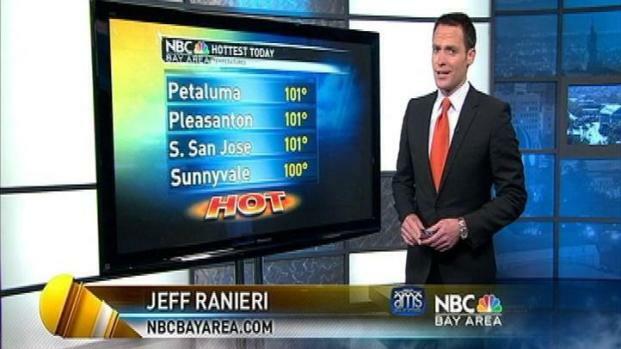 NBC Bay Area meteorologist Jeff Ranieri said both Pittsburg and Pleasanton will likely hit 100 degrees. Other East and South Bay cities could hit the triple digit mark as well. NBC Bay Area weather watcher Arsen Muger said his thermometer in the Almaden Valley of San Jose hit 101 on Monday for the first time since September 28. The official high temperatures did not make the 100 mark, but weather watchers are rarely wrong. Hottest In 9 Months. 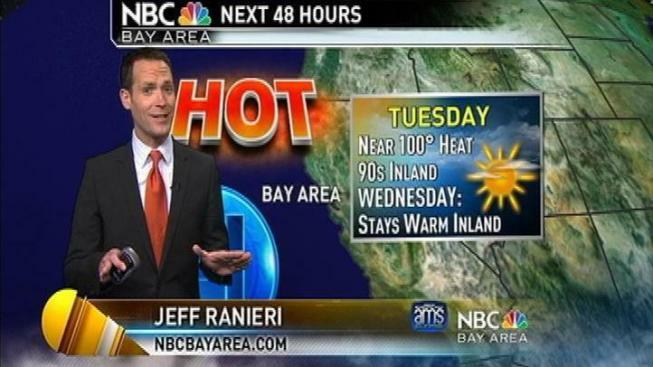 Jeff Ranieri Has The Extreme Weather Latest. The official high for most South and East Bay cities were in the high 90s Monday. Tuesday is also the Bay Area's first Spare the Air day of the brand new season. The Bay Area Air Quality Management District issues the warning on days it deems air quality hits the unhealthy zone. BAAQMD notes that last summer the first summer Spare the Air day was called until August. Officials would like you to help reduce smog levels by driving less.